Professor Ariadna Pichs had a dilemma. Her Advanced Spanish Writing course had a limited capacity to allow students time for discussion, but it was also in high demand because it satisfied a writing requirement. How could she preserve the quality of the course while making it available to more students? Pichs decided to offer her course online, leading her to the innovative teaching and learning team of GW Libraries and Academic Innovation (GWLAI). Instructional designers, teaching and learning specialists, instructional technologists, graphic designers, videographers, and librarians partner with faculty to transform a traditional course into an effective and engaging online course. “Faculty know their courses inside and out. We help them to envision new ways for their students to achieve course goals and learning objectives in an online environment,” said Maddy Kadish, leader of GWLAI’s team of instructional designers. At Kadish’s suggestion, Pichs scripted the lectures that the team recorded on video as a part of the course. 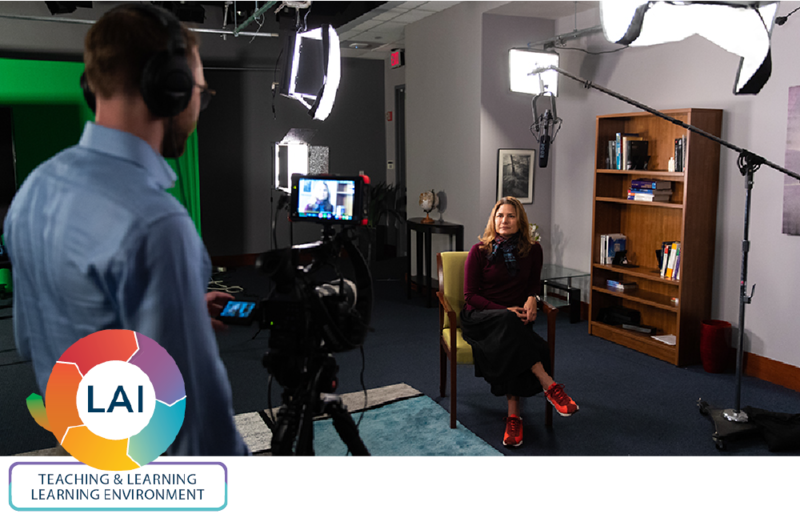 Compared to an in-person course, in which Pichs could easily leverage students’ questions to discuss related points, the online course needed to have video content that was engaging for online students who weren’t live. “It was short and efficient,” Pichs said.